Bioceutica is found at bioceutica.com and was formerly known as the Trump Network which The Donald bailed out on early last year, 2012. 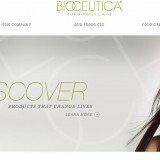 Bioceutica uses the multi-level marketing business model to sell its rebranded, repackaged nutritional products through distributors that are nudged to focus on building a ‘downline’ more than selling the actual product. Prior to DT’s involvement, it was known as Ideal Health, and sorting out, or rather, not sorting out the mess in the aftermath of the recent changes has resulted in very unhappy customers and distributors alike. Consider that the customers never received either product nor refund, and distributors’ compensation plan and, indeed compensation was gone. Despite several changes, Bioceutica faces many challenges, and using mlm as the way to get the product out will be the biggest of them. In any mlm business, most people quit after investing large sums only to fail in the first leg of their startup. The only ones that will earn substantially will be those at the top of the, dare I say, pyramid shaped hierarchy. That is the main reason we almost never recommend multi-level business opportunities as a way to make a living. It is going to be very difficult for anyone starting from scratch to attain any level of substantial success through mlm. The product does not stand out enough to make anyone holler praises about it, and by now in this day and age, most people you might approach have all experienced or know some who have experienced hard luck dealing with mlm. At the very least, the company is not riddled with the scandals and lawsuits other mlms I’ve reviewed are saddled with, but the difficulty is still there nonetheless. Due to these factors I do not recommend getting involved with Bioceutica as a way to make a living with. You will only end up with a garage full of product you can’t unload and a much depleted bank account trying to get somewhere with it.